It's dessert. In a beer bottle. That's what comes to mind when drinking Hardywood Park Raspberry Stout. I'm not a fan of "fruit beer" so I'm always hesitant when trying out a new beer that has fruit as a featured ingredient. However, when a brewery with a track record of good beers puts out a "Raspberry Stout," I'm going to try it despite any apprehension. 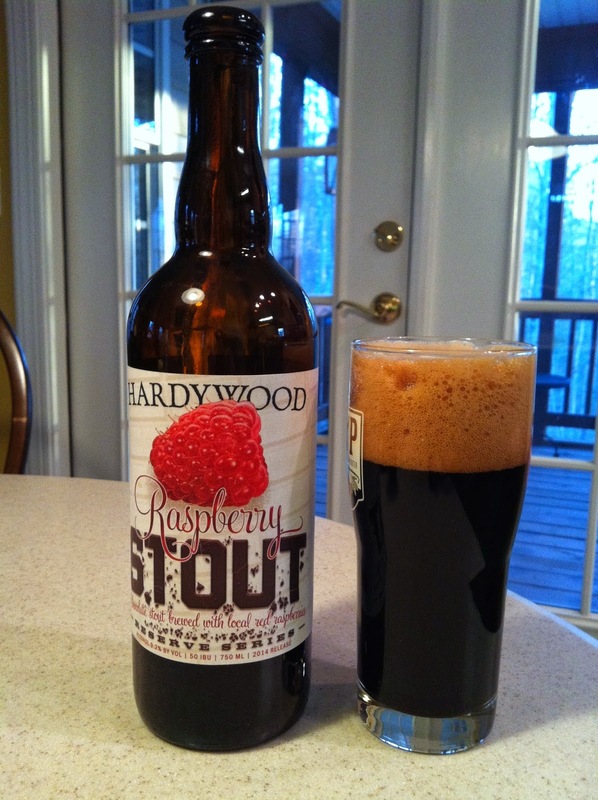 Hardywood Raspberry Stout is a February 2014 limited release from the Richmond, VA brewery. The beer is brewed with locally grown raspberries. The nearly black liquid is topped with a thick and frothy dark beige head. As soon as the cork came out of the bottle, I picked up the sweet berry aroma. Sticking my nose closer to the glass, the scent of dark cocoa was added. Already, my mind is forming an image of a German chocolate cake topped with raspberry drizzle. Taking a sip of the beer, the raspberry flavor is at the forefront. It's not a sticky sweet, or artificial, fruit flavor either, this is the flavor of fresh raspberries. Raspberries spooned over a dark chocolate cake to be exact. There is a hint of espresso-like bitterness coming through as well. A mild sweetness lingers in the finish. We decided to break out a box of chocolates to enjoy with the beer, completing the dessert-like experience. I enjoyed the Raspberry Stout very much. However, like that big piece of chocolate cake after a meal, one slice, er, glass, is enough. At 9.2% ABV, Hardywood Raspberry Stout is a treat to be sipped and savored.